However the DfT have made it crystal clear that not enough housing = not enough users to make the thing viable. Hence the doubts about the Southgate branch on the official analysis of the scheme. so the message is you had better get used to lots more urban intensification in future because thats how big new transport projects must be funded apparently. Have they? Is the 200,000 homes number a new or increased value? I didn't think it was. I'm struggling a tiny bit with the concept that CR2 won't have enough passengers given it's designed to relieve multiple sections of the tube and rail network which are stated as being horrendously overloaded and likely to get even worse. Yes support to regeneration and new housing in some designated areas is part of the package but surely that's not the sole determinant of the scheme proceeding? If it is we might as well stop work now because 200,000 new homes will never support £20+bn worth of expenditure on a cross London railway line. snoggle - absolutely - a typical PIC/CIL contribution from developers tends to be £1-2k per dwelling; even at £10k/dwelling, that's going to raise a mere £2bn - a spit in the ocean for CR2's cost. Though the route for Crossrail 2 has yet to be finalized, what are the likely proposed plans for the future eastern branch from Hackney if it does end up being approved? Is it still envisioned that Crossrail 2’s Proposed Eastern Branch if finalized would eventually take over the Epping branch of the Central line (from Leytonstone) which some have suggested or have other alternative routes for the proposed Eastern Branch been considered? Not whether this particular thread belongs in the feasible sub-forum as it is more a question to get an idea as to what is currently being discussed and possible rather than a suggestion. Whoa there - you are getting far to carried away with yourself there. NO official work has been done on the possible Eastern branch (other than to admit it is a theoretical possibility at some unspecified time in the future) as all key stakeholders are determined to get the Broxbourne + New Southagate options approved which removes the immediate need for any Eastern branch. If CR2 gets built as planed its quite possible that a North Greenwich situation* might occur even if passive provision is made for a 3rd northern branch. *(As in build the necessary junction tunnels so as not to disrupt the as built railway should an extra branch be added later - only to find that demand on the as built route is far too great to be able to take advantage of them and add the branch anyway. Understand it is all speculation at the moment and that it is likely the CR2 eastern branch does not happen, simply interested to know the potential routes such a branch would likely take down the road if it did happen or was somehow re-purposed into another Crossrail route. Can see why some would currently suggest the CR2 eastern branch take over all / part of the Central line's Epping branch given its usage by consumers coming further afield from deep into Essex and beyond (though would argue the Hainault via Newbury Park branch is a lot more crowded during rush hour), just interested to know of the likely alternatives through the east / northeast that do not appear to potentially conflict with CR1 or entail butchering the Central line. 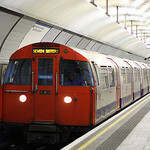 The Epping branch takeover was proposed for the Chelsea - Hackney route and would have been worked by the same size trains as the Central line. Time has moved on. A dual carriageway has been built next to Leytonstone station which restricts the options and any new line will have full size trains which wouldn't be able to share track and platforms with the Central line. Understand though would it not still be possible for CR2 to take over the Epping branch from Chingford via Loughton (since both overground and sub-surface appear to be options) or have other options been explored since then such as re-joining the main CR2 branch at Tottenham Hale from Hackney via Clapton (or from Hackney to Tottenham Hale via Stratford International and Lea Bridge) or a different route towards the east / northeast altogether? a North Greenwich situation* might occur even if passive provision is made for a 3rd northern branch. See also the 111-year old step-plate junctions at South Kensington (Picc), still waiting for the first Deep Level District services to Mansion House. I'm not sure what you are getting at here. Any similarity between CR2 and the previous Chelsea - Hackney tube is confined merely to the route through central London and the goals of serving the Chelsea / Wimbledon and Hackney areas. CR2 has been, for a long time now (even the 'metro version'), been a line built to accommodate UK standard gauge trains - NOT tube sized ones. As such if CR2 were somehow routed to Epping via the current central line (which has had numerous alterations to odd bits of infrastructure - plus new build stuff like the structures associated with the A12 at Leytonstone, then serious rebuilding involving significant line closures) would be needed.